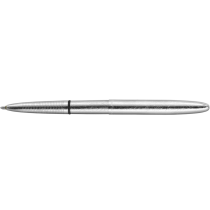 Fisher Space Pen rose to prominence when founder Paul Fisher invented a retractable, pressurized pen called the Anti-Gravity 7 (#AG7) that worked flawlessly in zero gravity aboard the first manned Apollo mission in 1968. Five decades later the company continues to thrive with pens still flown aboard every manned space flight. After Paul Fisher earned NASA as a customer for his revolutionary Space Pen, he continued to focus his efforts on developing unique, quality products. All Fisher Space Pens are handcrafted and able to write underwater, over grease, at any angle, upside down, 3-times longer than the average pen, in extreme temperatures ranging from (-30°F to +250°F), and in zero gravity. "People find that our technology is by far the most reliable from both a shelf-life and environmental standpoint." says Cary Fisher, now co-owner and Paul's son. 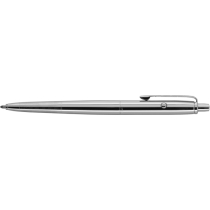 One of Paul Fisher's first ideas was for the iconic Bullet Pen, named for its sleek rounded ends. 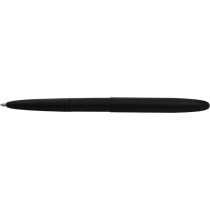 This particular Space Pen is in The Museum of Modern Art's permanent collection as a symbol of American industrial design. This mid-century modern pen is still available today in 16 colors and finishes and remains one of Fisher Space Pen's most popular gift items. "The stick pen is a consumer-industrial product," Cary says. "The Space Pen is a gift item." Fisher's varieties of pens - such as the Trekker Space Pen comes with a breakaway lanyard, making it easily attachable to a belt loop, backpack, purse or climbing gear - are manufactured and assembled in the company's 30,000-square-foot warehouse in Boulder City, Nevada. Approximately 65 employees create the company’s unique line of high-quality writing instruments. “Our whole culture is to treat people with respect and dignity. I know everybody by first and last name. Every job is valuable to the company,” Fisher says. Today, Cary runs the company with Donald “Dock” Wong, who has been at Fisher Space Pen for almost 50 years. Cesar Reveles one of their plant managers and loyal employee for 27 years notes, "We're a small company, but we're all focused on one thing: making a great product. We’re upholding the whole notion of 'Made in America,' which, I think, still counts."